Serving the Orange County Convention Center and International Drive in Orlando, Florida since 2006. Founded in June 2006, Redi Pedi Cab Company is a bicycle-pulled rickshaw service that offers short-haul transportation, outdoor mobile advertising, and sponsorship opportunities via pedicabs, also known as, rickshaws and bike taxis. We have helped people get from point A to point B in locations, such as, International Drive, the Orange County Convention Center, Downtown Orlando, the Daytona International Speedway, the Altamonte Mall, the St. John Town Center, Jacksonville, Gainesville, and Busch Gardens Tampa. Our Operations - All drivers are put through training for proper customer service and safe operations of our pedicabs. In addition, we meet periodically with property managers and directors to ensure we are providing the level of service they are expecting. 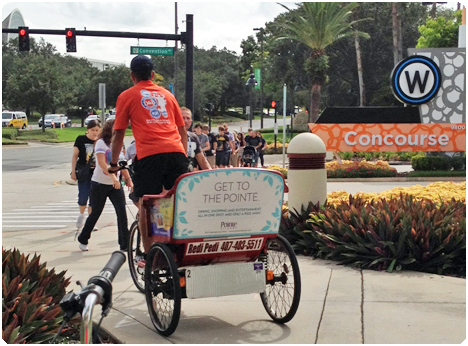 Our Size - Redi Pedi has the largest fleet of pedicabs available at the Orange County Convention and through out Central Florida. Our Insurance - Not only does Redi Pedi carry 4 times the minimum general liability insurance requirement put forth by the City of Orlando and the Orange County Convention Center, but also we list our drivers on our policy as additional insured. 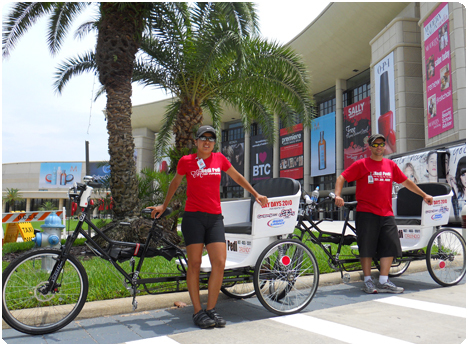 Redi Pedi is the unofficial official pedicab company of the Orange County Convention Center. We can not officially say we are the official pedicab company of the convention center. Therefore, we say the next best thing and that is, "We are the unofficial official pedicab company of the Orange County Convention Center."